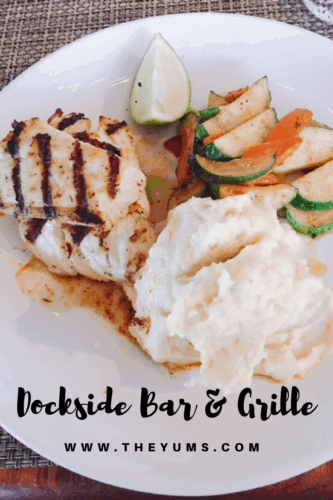 Enjoy gourmet dining in an elegant yet casual setting, with phenomenal waterfront views as the backdrop to your dining experience, at Dockside Bar & Grille in the gorgeous waterfront Old Bahama Bay Resort. Menu: Located on the property at Old Bahama Bay Resort, Dockside Bar & Grille is open for lunch and dinner daily. Using fresh, local ingredients, each dish is cooked to order. The lunch menu offers Bahamian staples including Conch Chowder, Conch Fritters, Conch Burger, Grouper Wrap, Conch Salad and Grouper Fingers. The conch salad is prepared local style with tenderized diced , onions, tomatoes, green peppers, freshly squeezed lime juice and fresh local hot peppers for a bit of spice. The lime juice combined with the hot peppers offers a tangy, spicy bite to this island staple. The dinner menu offers Tamarind & Ginger Glazed Chicken Wings, Conch Fritters, Conch Salad, Bahamian Lobster, Cracked Conch, and Nassau Grouper. I am a fan of Bahamian lobster. With a slightly sweet flavor, this lobster sits on your palate and melts in your mouth. It is prepared grilled or broiled and served in the shell. I adore broiled Bahamian lobster. With just a touch of butter, lemon and garlic, the flavor of the lobster bursts open on your palate, with the garlic and lemon bringing the sweetness out, and then it slowly melts in your mouth. The Nassau grouper can be prepared any way you prefer. My preference for this tender fish is grilling. Dockside does not over-cook this their fish. Served perfectly cooked, with just a little salt and pepper to season, the grouper flakes in your mouth, with a bit of grill smoke to enhance the fresh fish flavor of the grouper. Thoughts: The soaring ceilings and warm honey-colored wood beams give the intimate dining space a more ample feeling. Crisp white table linens add to the upscale atmosphere. Take a stroll outside along the docks of the resort and watch the sensational sunsets that the Bahamas are known for. Painting the sky amazing shades of red, yellow and orange you can sip your cocktails as the sun slowly kisses the horizon goodnight. One of the features of Dockside Grille that we love is the “Cook Your Own Catch.” After a day of fishing some of the richest fishing grounds in the Bahamas, bring your catch to the Dockside Grille. They will prepare a mouth-watering tasty meal with side items. Always a surprise preparation, but always delicious! Let’s talk Lionfish. Lionfish are pesky non-indigenous fish that have found their way to the Bahamas and are reproducing at an alarming rate. On the flip side, this fish is delicate and delectable if prepared correctly. And Dockside Grille knows how to cook this fish! Served seared with a sweet potato puree in a seafood saffron broth with a corn and cilantro salsa this dish is tasty. The cilantro adds a little spice, but it is not overwhelming. It is just enough to wake up your tastebuds and contrasts nicely with the saffron broth and delicate lionfish.